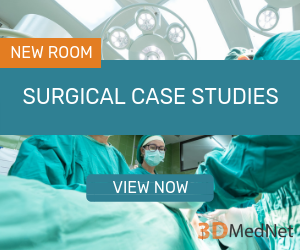 Learn more about how to use our new 'rooms' on 3DMedNet, dedicated to the broader applications of 3D printing in medicine and surgical case studies. 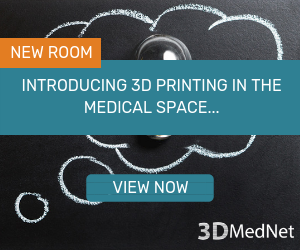 3DMedNet are delighted to launch our new ‘rooms’ – spaces designed for themed content, conversations and networking within the medical 3D printing community. In this room, we have put together a variety of content focused on introducing different areas of 3D printing in the medical space. If you are new to 3D printing or simply want to know more about an area where 3D printing is being used that you may not be familiar with, this is the room for you! Keep up with our informative webinars, expert-led ‘3D in focus’ series, ‘Makin sense’ editorials and methodology videos as we continue to cover the diverse opportunities 3D printing offers the world of medicine. Also, use the conversations tool to ask questions to the community. Want advice or have a question? Perfect, post it here! This room contains a niche collection of stories and studies where 3D printing has been successfully implemented in surgery, from models and guides to implants. See 3D printing in action as these news stories cover case studies from across the world in human and veterinary medicine or share your own experiences via our conversations tool. If you are interested in staying up-to-date with the latest stories or conversation topics in either of these rooms, make sure you read more on how to ‘Watch’ or follow content on 3DMedNet, here.